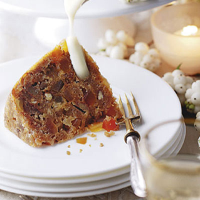 This is a delicious, lighter alternative to traditional Christmas pudding, prepared in just 20 minutes. Place the suet, flour, breadcrumbs, spice, sugar, pecans, tropical fruit and grated apple in a large bowl. Make a well in the centre, then add the rum and eggs, and mix well. Spoon into a buttered 1-litre pudding basin. Top with a circle of buttered greaseproof paper, then cover with a sheet of pleated foil, scrunching it firmly round the rim of the basin. Tie around the top of the basin with kitchen string. Place the basin in a steamer or sit it on an upturned, heatproof saucer in a large pan. Fill the pan three-quarters of the way up with boiling water, then cover and steam for 1½-2 hours, topping up occasionally with boiling water, if necessary. Remove from the steamer or pan and leave the pudding to cool for about 15 minutes before turning out and serving with Waitrose Vanilla and Fine Cognac Brandy Sauce or fresh cream. If you prefer not to use rum, try substituting it with 150ml cold camomile tea.The pudding can be made up to 3 days in advance and kept chilled. To reheat, steam for 30 minutes or until heated through. The tropical fruit flavours of this contemporary dish will go well with Riesling. This recipe was first published in Fri Dec 01 00:00:00 GMT 2006.